Allowing scenes/portions of films to be uploaded for limited amount of time for instructional purposes. The university has a responsibility to institute and promote a Policy concerning copyright and provide informational materials regarding copyright to its community. Materials must be course-specific and similar to what would be used in a face-to-face environment. Materials should be made available only to those enrolled in the specific course and not available on the "open web." Password-protected course pages in a CMS like Blackboard are an example of limiting access to materials. In addition, posted materials must be accompanied by a notice of copyright informing students that they are to be used in accordance with copyright law and the institution's copyright policies. As well, the TEACH Act and its support of online distance learning emphasizes the instructor's responsibility for knowing what can and cannot be posted for their students. 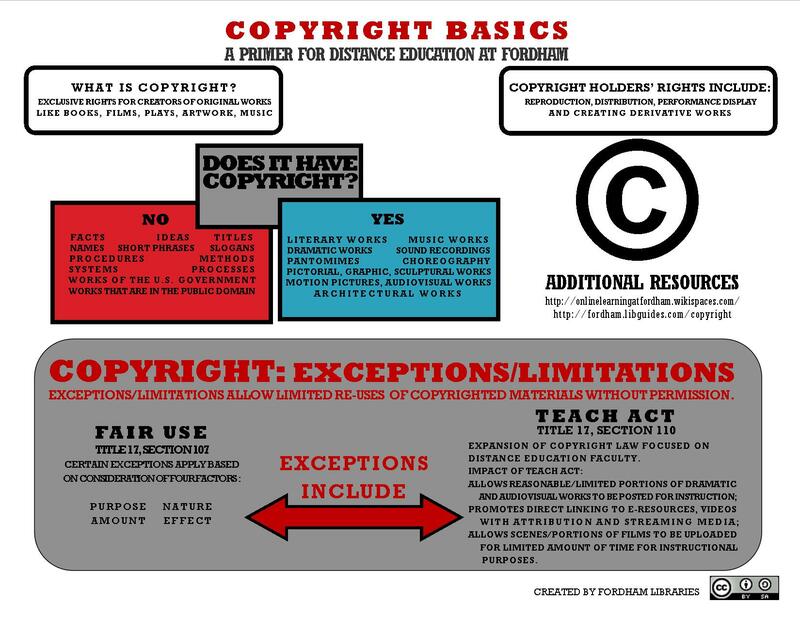 When they are using materials in accordance with the TEACH Act, they must keep in mind that they, as instructors, ultimately supervise the use of copyright works, and that the works they are using digitally are serving educational purposes and not entertainment and/or commercial purposes. Works that are "primarily for performance or display as part of mediated instructional activities transmitted via digital networks." This includes journal articles that institutions have readily available. If the database includes an article that is needed for educational purposes, the educator should link directly to the article rather than creating a digital copy in the act of uploading it. Copies of performances or displays that are "not lawfully made and acquired" under the U.S. Copyright Act. If it is understood that the material has been made and/or acquired unlawfully, the educational institution should not use the material. Do you want to learn more about online distance education at Fordham? Visit Fordham's page for online education, and check out our Additional Resources for more information regarding the TEACH Act. or, they can use non-copyrighted materials, such as works in the public domain. These options are all available for instructors since they are not limited to relying on only one exception for their instructional materials. According to the TEACH Act, if the institution has a direct link to a source that the course is using, then instructors are required to use the direct link to the source rather than uploading the material to the internet. Due to the licensing agreements between databases and libraries, there are regulations as to how institutions may use the articles for which they have temporary permissions. By linking directly from the database, the instructor and the institution eliminate the risk of not complying with the Copyright Law. For assistance in creating a permalink Ask-a-Librarian. your use qualifies as fair use.